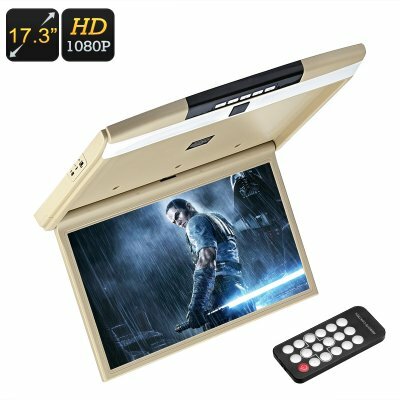 Successfully Added 17.3-Inch Roof Monitor - 1080p FHD, Remote Control, FM Transmitter, 2x Speaker, 32GB SD Card Slot, 32GB USB Port to your Shopping Cart. Entertain your passengers with this 17.3-Inch roof monitor. When attached to your car, your passengers will never have to feel bored again. Watch movies, series, and images – this car accessory brings along great on-the-road entertainment. It is suitable for all larger model cars, vans, and busses. The car media player offers the ultimate way for you to pimp up your ride. It even comes with a fully functional IR remote control. This makes your media player easy to operate for your passengers while enjoying a movie from the back seat. The monitor can be opened up to 45-degrees. Thanks to this, you’re allowed to adjust the angle to fit your own personal viewing comfort. By supporting 1080p resolution, this roof monitor provides stunning visuals. Whenever it is turned on, your passengers can enjoy vivid color and stunning detail. This truly treats them with a cinematic experience straight from the seat of your car. The flip down display furthermore features adjustable brightness and colors. Thanks to this, you’ll be able to enjoy clear images at any time of the day. Coming with a 32GB SD card slot, this car media player offers plenty of space for you to bring along your favorite movies and series. Additionally, it also supports a 32GB USB input. With all this external storage at hand, your passengers will be able to enjoy hours’ worth of entertainment while waiting to reach the upcoming destination. To further enhance your media experience, this flip down display comes with two intergraded stereos. With these powerful speakers and 1080p monitor, you’ll be treated with an exceptional audio-visual experience. Additionally, your car media player can be connected to the stereo system of your car. In this way, everybody is able to enjoy the media you’re playing. For those of you who wish to watch a movie without disturbing others, it also supports wireless headphones. Like this, your passengers will be able to enjoy a movie without distracting the driver. This roof monitor comes with a 12 months warranty, brought to you by the leader in electronic devices as well as wholesale electronic gadgets..